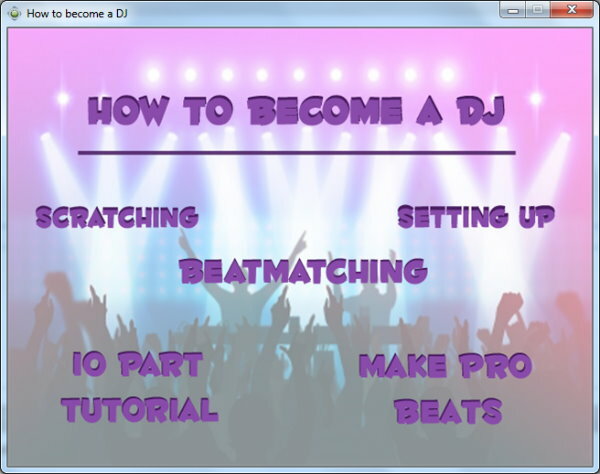 The DJ tutorial software is aimed to beginners. It teaches understandable basic knowledge for working as a DJ like technical foundations, scratching or beat matching. Do you want to play in your favourite bars and clubs instead of just going to them? Get on guest lists across town? Be â€œthe DJâ€ in your circle of friends? Do you dream of playing your favourite tunes to packed dancefloors of people who've come just to hear you? Of course you do! And as you've already guessed digital DJing can get you all of this more cheaply and more easily than ever was the case for vinyl and CD DJs. Trouble is though with all the different systems out there to choose from as well as digital music DJing techniques and technical skills to master it can be almost impossible for you - the new DJ - to know where to start. What gear is right for you? Where do you find the best music? What skills do you need? How do you plug your gear in when you get to the clubs? Hell what does a DJ even really do nowadays? Without proper answers to these questions you'll find it's costly time-consuming and frustrating to get to the stage where you can play a DJ set in public. It often used to take years for vinyl and CD DJs to master the basics never mind play real gigs - and while it can be easier to get going with digital you still need to practise the right things in order to do it well enough to play out. And the harsh truth is that without getting to the stage where you can play confidently in public on your new digital gear you're never going to get the success you want. You'll always be a bedroom DJ dreaming about it yet getting no closer to it happening for you. The DJ tutorial software show you where to find digital music as well as give you pro tips on how to build a DJ's digital library of the kind of tunes that'll blow away any audience - whatever your preferred style. You'll learn everything you need to know about using your new DJ controller right from the very basics and much more - you'll be performing your first mix in minutes!